SET the MOB button on the chart plotter located just inside the companionway to starboard. That sets a waypoint. ​The quick stop method used on Celtic Song follows this procedure (numbers refer to diagram above). Diane's rendering of the quick stop method. Essentially the same as above but offers more detail. Study it. Tack, leaving jib backwinded in heave-to position; sail past the victim on a beam reach, leaving 3 to 4 boat lengths before turning downwind, jibing and then heading up on a close reach, returning to the victim in the safety position (close reach with your sails luffing). 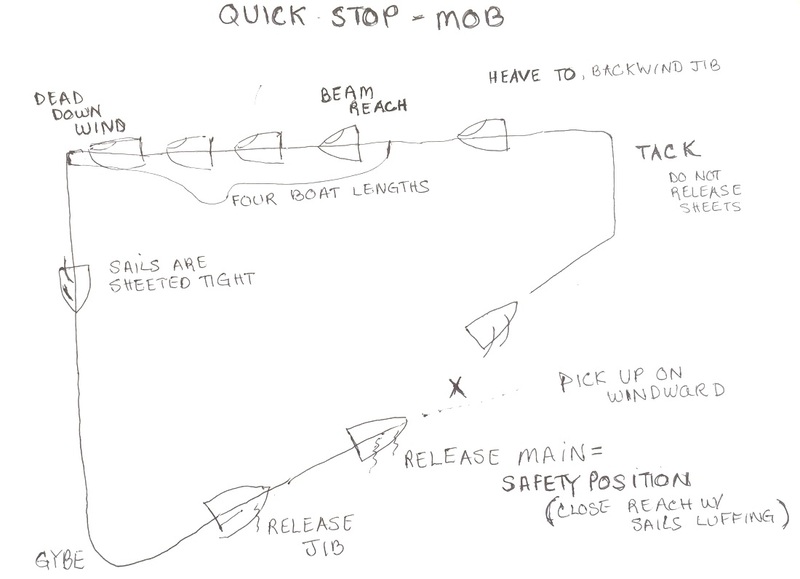 The safety position allows you to tighten sails and gain control of the boat in case you're too far away from the MOB. 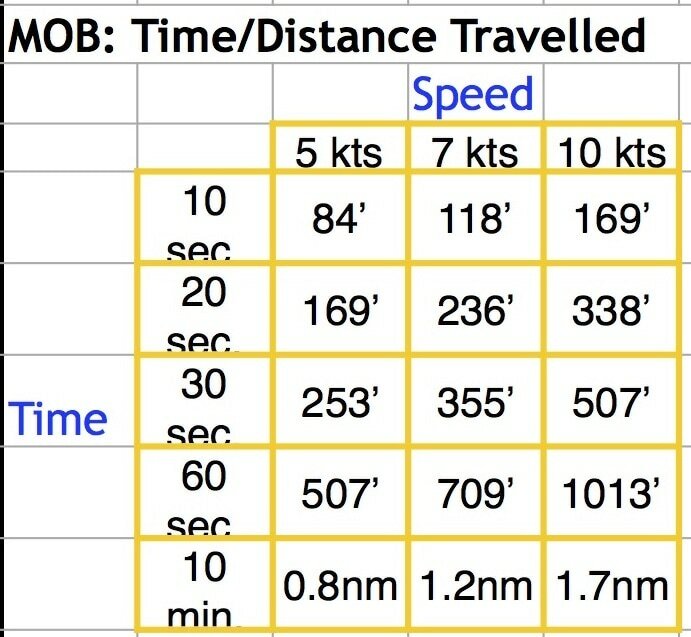 Most important is to turn the boat around immediately and stay with the victim. 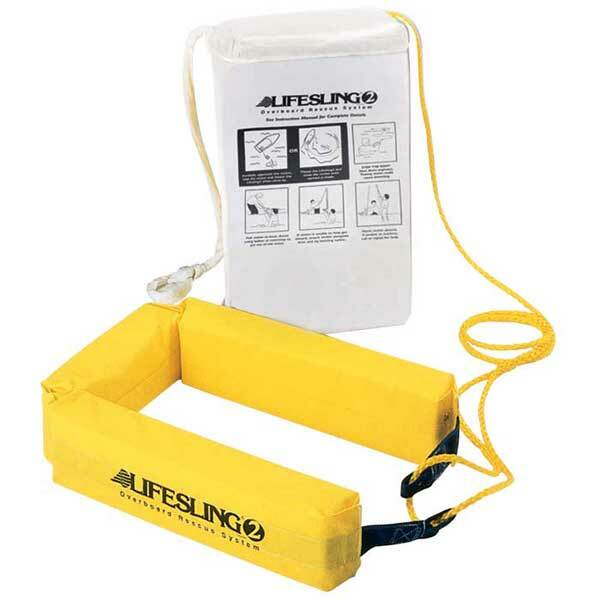 Throw whatever is available in the water (cushions, life ring, life sling, etc.) to help mark the spot. Don't be afraid to turn on the engine, but don't get too close to the victim with the propeller. Beware of lines in the water. Retrieve the MOB from the windward side of the boat. ​Turn the boat around; stay with the victim. Throw the life sling in the water and circle around the victim. If you are sailing down wind, pull the mainsail in before jibing. Do not adjust the jib lines. The sails will automatically go into a heave to position This will slow the boat down. Once the MOB has hold of the life sling, heave to and pull the person to the boat. Secure the sails. Rig the topping lift to the electric halyard winch and attach the shackle to the person to pull them out of the water. If you need to turn the engine on to maneuver be careful the prop does not make contact with the person in the water. 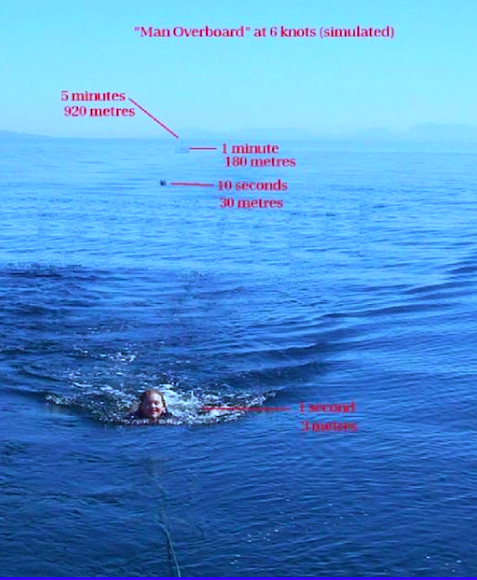 This simulated photo from a Bruce Brown Survival at Sea presentation makes the point that you need to act quickly when someone falls overboard. Or as Diane says, "Turn the damn boat around now!"